Pair this striped top with this blazer, this skirt, and this bright purse. Finish it off with your classic beige pumps (don't have any? Try these!) and you're all done. Now that I have mixed patterns in several outfits, I'm starting to feel more confident in my pattern mixing abilities! It is especially easy to mix patterns of the same color and/or same pattern. What are your pattern mixing tips? I love your blazer! 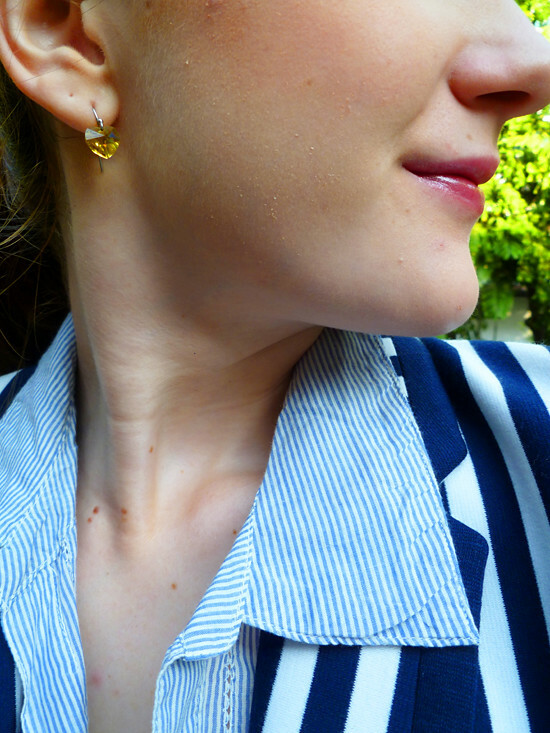 The stripes-on-stripes look is so fun. Have a wonderful weekend! yes, that definitely works well for pattern mixing - i also like to mix with in the same color pallet! You look amazing in "A" skirts + Blazer! 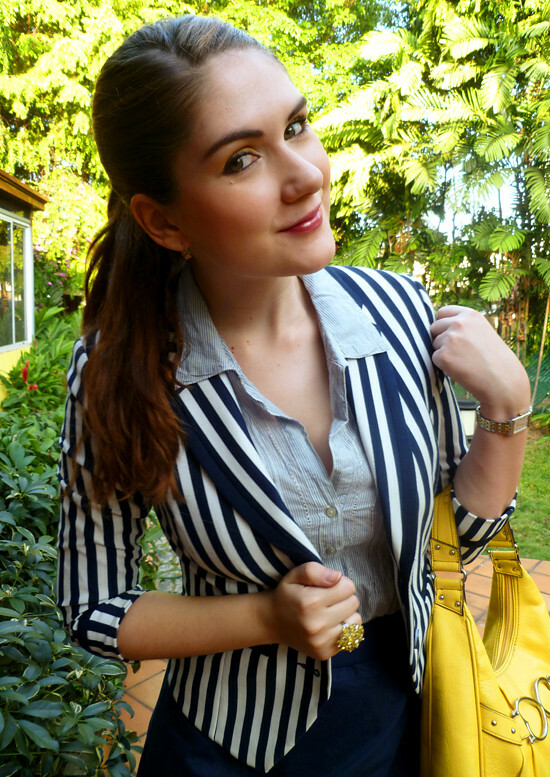 The stripes on the blazer looks great and I love the yellow bag! This outfit is totally adorable! Great yellow bag! I like this outfit it's simple but beautiful! and yea..do you have a channel on YouTube ? 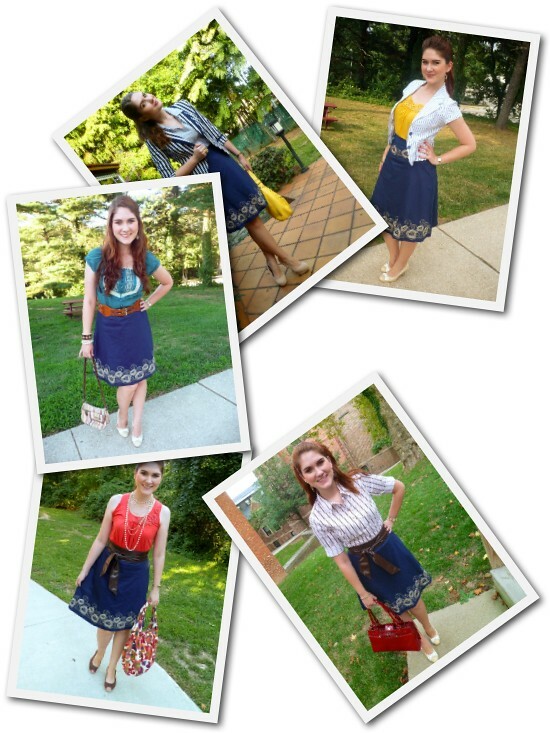 your pattern mixing is stellar, Marie! that blazer is really pretty! I think I need a pinstriped one now too :) Have a beautiful weekend, lovely! I have such reservations about pattern mixing when I see chaotic patterns randomly paired together. But this? This is Pattern Mixing Genius. great outfit! love the skirt and yellow bag. Hi Reema! Aaaww, I'm so glad that you liked my outfit, thank you so much for being supportive. I actually don't have a YouTube channel yet, but I would love to do one in the future! I have really wanted to do some makeup and hairstyle videos. Hopefully I will be able to make some soon!